Add car models to the list of things dividing liberal coastal states and the conservative heartland. The Trump administration's efforts to weaken vehicle pollution requirements could set up a split U.S. market, concentrating fuel-efficient cars in mostly Democratic states and gas guzzlers in the red states. President Trump's plans could drastically skew how much consumers pay for the same cars, depending on where they live. For example, a person walking into a showroom in New York might see discounted electric vehicles and small cars; someone shopping in Ohio could get a cheaper truck or SUV. It's a divide that already partly exists: Manufacturers introduce EVs in California first because it has a zero-emission vehicles sales quota. Here's why the rift could get deeper: Thirteen states and the District of Columbia have vowed to stick with the Obama-era stringency for mileage and emissions. Led by California, they say they need manufacturers to sell clean cars to meet climate and public health goals. And the coalition is growing. At least one more state — Virginia — is actively considering opting in to the more stringent rules if the Trump administration rolls back the federal standards. A handful of others, including moderate Midwestern states, have backed efforts to keep California's stringent rules in place in "solidarity." That broadens the fight over the vehicle rules that some have cast as a political battle between California — the leader of the fight against the rollbacks — and the Trump administration. As Trump considers flatlining fuel economy standards and revoking California's ability to set its own, more stringent rules, states representing nearly half the country's population are fighting back to make manufacturers sell cleaner cars. "This is an important group of states that is united in opposition to weakening the federal standards," said Jared Snyder, the deputy commissioner for air resources, climate change and energy at the New York State Department of Environmental Conservation. New York is one of the states that has adopted California's rules, which would bring average fuel economy in 2025 to 54.5 mpg, or 36 mpg in the real world. It can do so under a special Clean Air Act clause that allows California to set more stringent vehicle pollution rules because of its historical problems with smog and lets other states opt in to California's program over the federal program. Along with the District of Columbia, 11 other states have also done so for passenger cars and trucks: Connecticut, Delaware, Maine, Massachusetts, Maryland, New Jersey, Pennsylvania, Oregon, Rhode Island, Vermont and Washington. They are dubbed "Section 177" states after the Clean Air Act clause. They agreed to accept the federal standards in a historic 2009 deal that saw EPA set its federal requirements almost as high as California's. But now the federal rules are being lowered. And they're desperate to save California's ability to set its own rules. 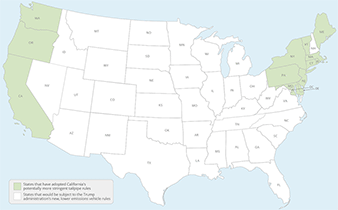 At stake in the current clash are the states' commitments to reduce greenhouse gas emissions. New York, for example, could zero its emissions in every sector but transportation and still not reach its 2050 goal, because cars and trucks represent nearly 34 percent of its pollution, said Snyder. "We really need to turn that curve downward," he said. At stake for the rest of the country is the type of vehicle consumers will have easy access to. If the Trump administration rolls back federal requirements and is unable to stop California and its allies from sticking with the higher targets, manufacturers will be faced with their ultimate nightmare: a patchwork of regulations. 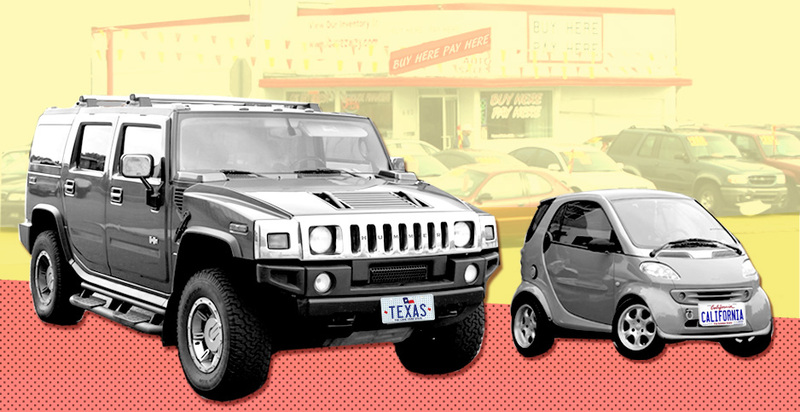 Under a draft Trump plan, manufacturers would have to sell cars that average 54.5 mpg in the coastal states in 2025 and 40 mpg in the rest of the country. John DeCicco, a research professor at the University of Michigan Energy Institute, says they'll handle it by manipulating prices. Much of the technology is already in development, so it's unlikely they'll significantly change their designs in the next few years. "There's going to be some shuffling," he said. "If they have to sell a more efficient mix of cars in California, they'll have to price the more fuel-consumptive cars higher, to suppress their sales. They'll have to put more incentives, discounts, dollars on the hood for more fuel-efficient vehicles, to press those, compared to Ohio and Nebraska." More states consider joining Calif. The federal rollback comes at a time when states and cities are making a show of pursuing climate initiatives as a way to snub Trump. The U.S. Climate Alliance includes 17 governors — 11 of whom would get the Obama-era stringency levels for cars. The other states, like Minnesota and Virginia, have often stepped in to back up California. When California sued EPA Administrator Scott Pruitt this week to prevent him from lowering the targets, it was joined by 16 states and D.C. On top of the Section 177 states that have adopted California's clean car program, Virginia, Minnesota, Illinois and Iowa also joined the lawsuit. Together, the states represent 140 million people, or 44 percent of the country's population, California Gov. Jerry Brown (D) said when announcing the lawsuit. For the states that would be subject to the revised, lower federal standards, the lawsuit offered a way to declare opposition. "The EPA is attempting to roll back standards that were created to reduce greenhouse gas emissions and protect the public's health," Illinois Attorney General Lisa Madigan (D) said in a statement. Her statement emphasized that the lawsuit was meant to protect the "federal standards." Iowa Attorney General Tom Miller (D) "has long been an advocate for reducing greenhouse gas emissions from a variety of sources," said a spokeswoman. She added that she did not believe Iowa was considering adopting California's rules. But some states are considering taking that extra step. Virginians elected Democratic Gov. Ralph Northam last year. As soon as he got into office, he began an ambitious program to ratchet down carbon emissions from the power sector. In April, he ordered his staff to review any gaps between existing policies and environmental goals. That review will analyze the federal rollback on clean car rules and could recommend Virginia join California's program, said Angela Navarro, deputy secretary for natural resources for Virginia. "Addressing the impacts of climate change is a very important issue for this governor and administration," said Navarro. "We recognize the transportation sector also is a significant source of carbon pollution, and we need to look at ways to reduce our carbon footprint." Jacque Montgomery, a spokeswoman for Colorado Gov. John Hickenlooper (D), said the state was "looking at all options." Hickenlooper has sought to expand EV charging infrastructure as a way to reduce the state's greenhouse gas emissions.